Is your mouth watering yet? Don’t they look amazing? They are! Want to know how to make them? No, I can’t tell you, it’s a secret. My sister found this recipe from Yammie’s Noshery. One Saturday she made them. They were amazing. They made twelve and as there were only six people home at the time we each got two. I ate both, felt stuffed afterwards, but the they were worth it. I highly recommend you try them. I was a little skeptical as to whether they would taste like Auntie Anne’s but they did. Be sure and try them out yourself. The best part; eating them, but forming them was fun too! We have made them twice so far and everyone has loved them. 1. The recipe also has a recipe for cheese sauce. We did not make the cheese sauce as we didn’t think it would be good with them. But that is your own personal opinion. 2. Right when they come out of the oven you dip them all over in melted butter. We ended up needed about twice the amount of butter to coat all twelve. 3. Be generous when salting them, but also be careful; it’s hard to get the balance right. First time she made them she didn’t put enough salt, second time there was too much salt on some of them. 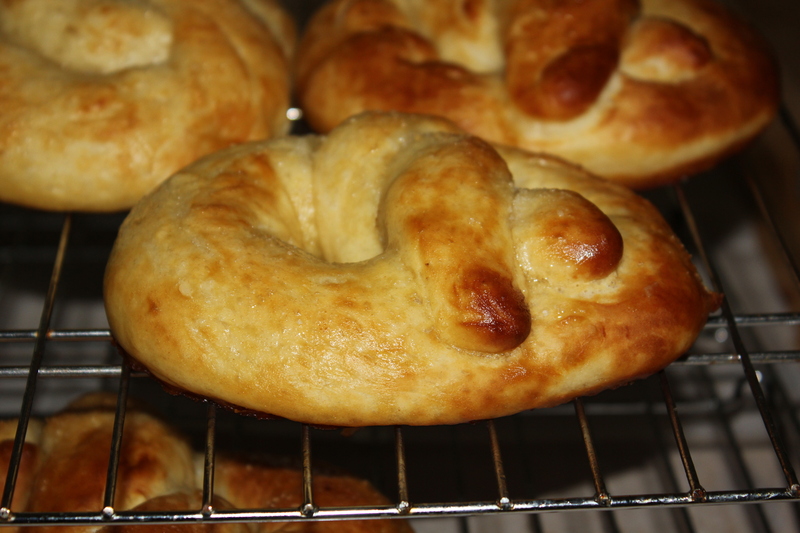 I hope you enjoy making these pretzels!